For scientific disciplines, see Cognitive geography and Environmental Psychology. Psychogeography is an exploration of urban environments that emphasizes playfulness and "drifting". It has links to the Situationist International. Psychogeography was defined in 1955 by Guy Debord as "the study of the precise laws and specific effects of the geographical environment, consciously organized or not, on the emotions and behavior of individuals." It has also been defined as "a total dissolution of boundaries between art and life". Another definition is "a whole toy box full of playful, inventive strategies for exploring cities... just about anything that takes pedestrians off their predictable paths and jolts them into a new awareness of the urban landscape." Psychogeography was originally developed by the avant-garde movement Lettrist International in the journal Potlatch. The originator of what became known as unitary urbanism, psychogeography, and the dérive was Ivan Chtcheglov, in his highly influential 1953 essay "Formulaire pour un urbanisme nouveau" ("Formulary for a New Urbanism"). The Lettrists' reimagining of the city has its precursors in aspects of Dadaism and Surrealism. The idea of urban wandering relates to the older concept of the flâneur, theorized by Charles Baudelaire. Following Chtcheglov's exclusion from the Lettrists in 1954, Guy Debord and others worked to clarify the concept of unitary urbanism, in a bid to demand a revolutionary approach to architecture. At a conference in Cosio di Arroscia, Italy in 1956, the Lettrists joined the International Movement for an Imaginist Bauhaus to set a proper definition for the idea announced by Gil J. Wolman: "Unitary Urbanism - the synthesis of art and technology that we call for — must be constructed according to certain new values of life, values which now need to be distinguished and disseminated." It demanded the rejection of functional, Euclidean values in architecture, as well as the separation between art and its surroundings. The implication of combining these two negations is that by creating abstraction, one creates art, which, in turn, creates a point of distinction that unitary urbanism insists must be nullified. This confusion is also fundamental to the execution of unitary urbanism as it corrupts one's ability to identify where "function" ends and "play" (the "ludic") begins, resulting in what the Lettrist International and Situationist International believed to be a utopia where one was constantly exploring, free of determining factors. In "Formulary for a New Urbanism", Chtcheglov had written "Architecture is the simplest means of articulating time and space, of modulating reality, of engendering dreams". Similarly, the Situationists found contemporary architecture both physically and ideologically restrictive, combining with outside cultural influence, effectively creating an undertow, and forcing oneself into a certain system of interaction with their environment: "[C]ities have a psychogeographical relief, with constant currents, fixed points and vortexes which strongly discourage entry into or exit from certain zones". The Situationists' response was to create designs of new urbanized space, promising better opportunities for experimenting through mundane expression. Their intentions remained completely as abstractions. Guy Debord's truest intention was to unify two different factors of "ambiance" that, he felt, determined the values of the urban landscape: the soft ambiance — light, sound, time, the association of ideas — with the hard, the actual physical constructions. Debord's vision was a combination of the two realms of opposing ambiance, where the play of the soft ambiance was actively considered in the rendering of the hard. The new space creates a possibility for activity not formerly determined by one besides the individual. However, the Situationist International may have been tongue-in-cheek about some parts of psychogeography. "This apparently serious term 'psychogeography'", writes Debord biographer Vincent Kaufman, "comprises an art of conversation and drunkenness, and everything leads us to believe that Debord excelled at both." Eventually, Debord and Asger Jorn resigned themselves to the fate of "urban relativity". Debord readily admits in his 1961 film A Critique of Separation, "The sectors of a city…are decipherable, but the personal meaning they have for us is incommunicable, as is the secrecy of private life in general, regarding which we possess nothing but pitiful documents". Despite the ambiguity of the theory, Debord committed himself firmly to its practical basis in reality, even as he later confesses, "none of this is very clear. It is a completely typical drunken monologue…with its vain phrases that do not await response and its overbearing explanations. And its silences." While a reading of the texts included in the journal Internationale Situationniste may lead to an understanding of psychogeography as dictated by Guy Debord, a more comprehensive elucidation of the term would come from research into those who have put its techniques into a more developed practise. While Debord's influence in bringing Chtchglov's text to an international audience is undoubted, his skill with the 'praxis' of unitary urbanism has been placed into question by almost all of the subsequent protagonists of the Formulary's directives. Debord was indeed a notorious drunk (see his Panegyrique, Gallimard 1995) and this altered state of consciousness must be considered along with assertions he made regarding his attempts at psychogeographical activities such as dérive and constructed situation. The researches undertaken by WNLA, AAA and the London Psychogeographical Association during the 1990s support the contention of Asger Jorn and the Scandinavian Situationniste (Drakagygett 1962 - 1998) that the psychogeographical is a concept only known through practise of its techniques. Without undertaking the programme expounded by Chtchglov, and the resultant submission to the urban unknown, comprehension of the Formulary is not possible. As Debord himself suggested, an understanding of the 'beautiful language' of situationist urbanism necessitates its practice. Psychogeography combines subjective and objective knowledge and studies. Debord struggled to stipulate the finer points of this theoretical paradox, ultimately producing "Theory of the Dérive" in 1958, a document which essentially serves as an instruction manual for the psychogeographic procedure, executed through the act of dérive ("drift"). In the SI's 6th issue, Raoul Vaneigem writes in a manifesto of unitary urbanism, "All space is occupied by the enemy. We are living under a permanent curfew. Not just the cops — the geometry". Dérive, as a previously conceptualized tactic in the French military, was "a calculated action determined by the absence of a greater locus", and "a maneuver within the enemy's field of vision". To the SI, whose interest was inhabiting space, the dérive brought appeal in this sense of taking the "fight" to the streets and truly indulging in a determined operation. The dérive was a course of preparation, reconnaissance, a means of shaping situationist psychology among urban explorers for the eventuality of the situationist city[clarification needed]. Since the 1990s, as situationist theory became popular in artistic and academic circles, avant-garde, neoist, and revolutionary groups emerged, developing psychogeographical praxis in various ways. Influenced primarily through the re-emergence of the London Psychogeographical Association and the foundation of The Workshop for Non-Linear Architecture, these groups have assisted in the development of a contemporary psychogeography. 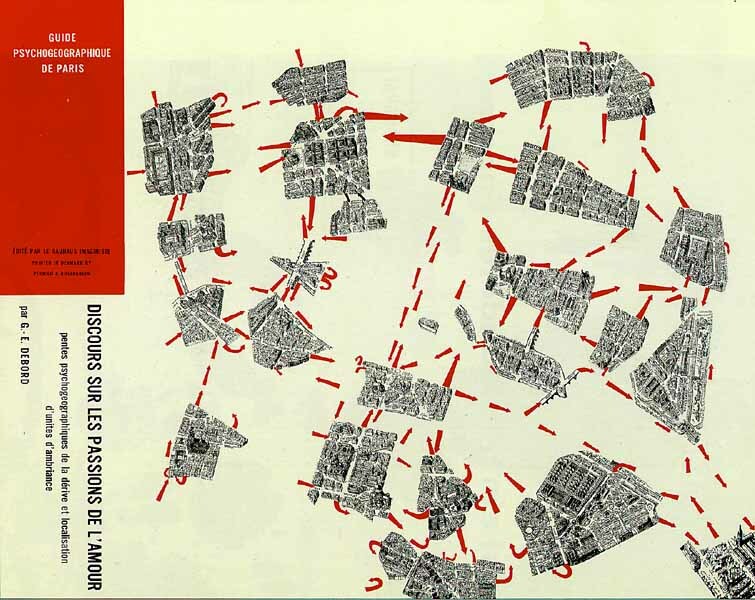 Between 1992 and 1996 The Workshop for Non-Linear Architecture undertook an extensive programme of practical research into classic (situationist) psychogeography in both Glasgow and London. The discoveries made during this period, documented in the group's journal Viscosity, expanded the terrain of the psychogeographic into that of urban design and architectural performance. The journal Transgressions: A Journal of Urban Exploration (which appears to have ceased publication sometime in 2000) collated and developed a number of post-avant-garde revolutionary psychogeographical themes. The journal also contributed to the use and development of psychogeographical maps which have, since 2000, been used in political actions, drifts and projections, distributed as flyers. Since 2003 in the United States, separate events known as Provflux and Psy-Geo-conflux have been dedicated to action-based participatory experiments, under the academic umbrella of psychogeography. Psychogeography also become a device used in performance art and literature. In Britain in particular, psychogeography has become a recognised descriptive term used in discussion of successful writers such as Iain Sinclair and Peter Ackroyd and the documentaries of filmmaker Patrick Keiller. The popularity of Sinclair drew the term into greater public use in the United Kingdom. Though Sinclair makes infrequent use of the jargon associated with the Situationists, he has certainly popularized the term by producing a large body of work based on pedestrian exploration of the urban and suburban landscape. Sinclair and similar thinkers draw on a longstanding British literary tradition of the exploration of urban landscapes, predating the Situationists, found in the work of writers like William Blake, Arthur Machen, and Thomas de Quincey. The nature and history of London were a central focus of these writers, utilising romantic, gothic, and occult ideas to describe and transform the city. Sinclair drew on this tradition combined with his own explorations as a way of criticising modern developments of urban space in such key texts as Lights Out for the Territory. Peter Ackroyd's bestselling London: A Biography was partially based on similar sources. Merlin Coverley gives equal prominence to this literary tradition alongside Situationism in his 2006 book Psychogeography, not only recognising that the situationist origins of psychogeography are sometimes forgotten, but that via certain writers like Edgar Allan Poe, Daniel Defoe, and Charles Baudelaire, they had a shared tradition. Novelist Will Self had a column "Psychogeography" which started out in the British Airways Inflight magazine and then appeared weekly in the Saturday magazine of The Independent newspaper until October 2008. After a few years of practicing, the psychogeography group that gravitates around the Urban Squares Initiative and Aleksandar Janicijevic, the initiator of, and main figure in organizing and leading this group, came up with the working definition of this procedure as: "The subjective analysis–mental reaction, to neighbourhood behaviours related to geographic location. A chronological process based on the order of appearance of observed topics, with the time delayed inclusion of other relevant instances". In 2013 Aleksandar Janicijevic published "Urbis - Language of the urban fabric" as a visual attempt to rediscover lost or neglected urban symbols. In 2015 another book was published "MyPsychogeography", an attempt to synthesize sketches and ideas which have informed his art practice. ^ Hart, Joseph (July/August 2004). "A New Way of Walking". Utne Reader. ^ Wolman, Gil (1956). Address by the Lettrist International Delegate to the Alba Conference of September 1956 ALba: Lettrist International. ^ Chtcheglov, Ivan (1953). "Formulary for a New Urbanism". ^ a b Knabb 1995, p. 50. ^ Kaufman 2006, p. 114. ^ Gray, Christopher, ed. (1998). Leaving the 20th Century: the Incomplete Work of the Situationist International, London: Rebel Pub.. p. 26. ^ McDonough 2004, p. 259. ^ "psychogeography.org weblog and archive". Retrieved 2017-07-28. ^ "psychogeography now – window to the urban future | ……". Photoblog.urbansquares.com. Archived from the original on 2013-06-06. Retrieved 2013-04-18. Kaufman, Vincent (2006). Guy Debord: Revolution in the Service of Poetry. Minneapolis: University of Minnesota Press. Knabb, Ken, ed. (1995). Situationist International Anthology. Berkley: Bureau of Public Secrets. McDonough, Tom, ed. (2004). Guy Debord and the Situationist International: Texts and Documents. Boston: October Press. Balsebre, Gianluigi (September 1995). Della critica radicale. Bibliografia ragionata sul'internazionale situazionista con testi inediti in italiano (in Italian). Bologna: Grafton. Balsebre, Gianluigi (1997). Il territorio dello spettacolo (in Italian). Bologna: Potlatch. Coverley, Merlin (2006). Psychogeography. London: Pocket Essentials. Debord, Guy, ed. (1996). Guy Debord presente Potlatch. Paris: Folio. Ford, Simon (2005). The Situationist International: A User's Guide. London: Black Dog Publishing. Home, Stewart (1997). Mind Invaders: A Reader in Psychic Warfare, Cultural Sabotage and Semiotic Terrorism. London: Serpent's Tail. Law, Larry; Chris Gray, editors (1998). Leaving the 20th Century: the Incomplete Work of the Situationist International. London: Rebel P.
Sadler, Simon (1998). The Situationist City. Cambridge: MIT P.
Vazquez, Daniele (2010). Manuale di Psicogeografia. Cuneo: Nerosubianco edizioni. Wark, McKenzie (2008). 50 Years of Recuperation of the Situationist International. New York, Princeton Architectural.